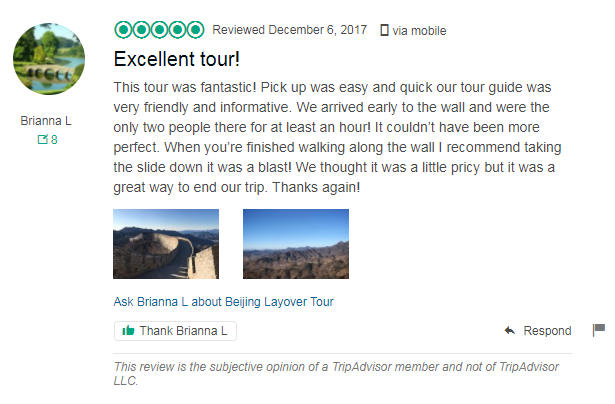 Tour Description: Be picked up by our private guide and driver from Beijing capital airport and then drive about 1 hour to Mutianyu Great Wall. Hike the wall for as long as you can; cable car up or toboggan down is optional. Mutianyu section boasts spectacular scenery and less crowded than other sections. 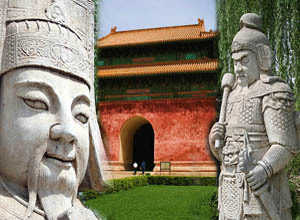 Move on to the Ming Tombs to visit the mysterious Dingling Underground Palace. Be escorted back to airport after the trip. End of our service. Hello! I have a 14 hour layover in Beijing on 3/26. I get in at 11:05 am. Will I have enough time to go to Mutianyu? Thank you! Yes, according to your arrival time, you will have plenty of time to visit the Mutianyu Great Wall.